Description: SCP-1799 is a male humanoid, approximately 1.2m tall, weighing 58kg. SCP-1799 has the physical characteristics of a generic clown. The subject's hair does not grow, with skin devoid of pigmentation and a circular red nose, along with elongated feet. 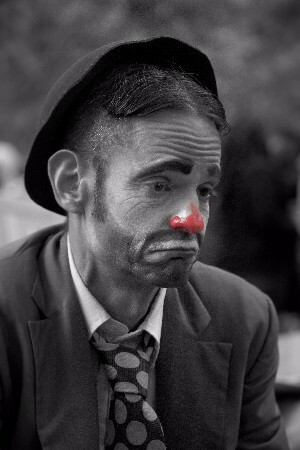 Facial pigmentation has the appearance of makeup commonly worn by circus performers. Anything that SCP-1799 verbally communicates to humans will be interpreted by the individual(s) as a joke. The longer the subject continues speaking, the funnier the "jokes" will become, until the subject(s) are overcome by laughter. Due to this effect, it is extremely difficult to direct and interact with SCP-1799. The only known way to communicate with the subject is through written word, as this does not activate the effect. The words "Mr. Laugh, from Little Misters ® by Dr. Wondertainment" are tattooed upon SCP-1799's lower back. This designation appears as "3" in Document SCP-909-a. SCP-1799: Sure. They called me… Mr. Laugh. Note: Dr. B███ requested to be transferred away from the SCP-1799 project. ADDENDUM 1799-B: During an experiment on ██/██/20██, SCP-1799 began yelling at D-9023. The subject began laughing incessantly, and, in this distracted state, tripped and suffered a severe cranial injury, which proved to be fatal. SCP-1799 became noticeably withdrawn and sullen following the event, leading to SCP-1799's first suicide attempt. As of ██/██/20██, SCP-1799 has been put on suicide watch. ADDENDUM 1799-C: This note was found on SCP-1799's person during initial containment.